The ‘opener of the sun’ Sinicuichi has calming and euphoric effects. For some people, Sinicuichi also works as a ‘sound hallucinogen’: it warps and morphs sounds and makes it seem as though sound comes from a faraway place. Contains 2 grams of Sinicuichi Extract 10x. In sealed plastic packaging. Sinicuichi has calming effects. Consuming Sinicuichi can lead to euphoric feelings and relaxes the nervous system. You’ll become drowsy, relaxed and cheerful. In addition, Sinicuichi sometimes works as a ‘sound hallucinogen’: it twists and warps noises and makes it seem as though sound comes from a faraway place. You can use this Sinicuichi Extract 10x to brew a tea. Mix a maximum of one gram of the extract with 3 cups of water and leave it to boil for a while on low heat. This extract is 10x more concentrated than regular dried Sinicuichi leaves. 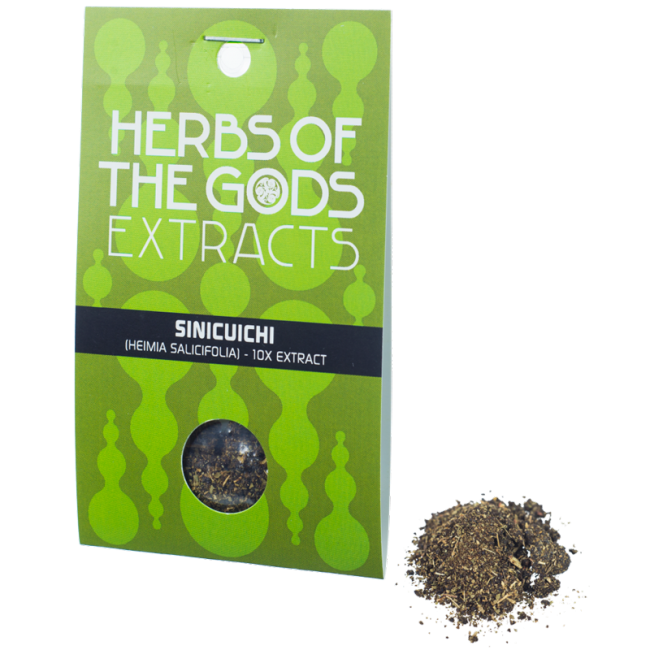 The day after using Sinicuichi, you may experience feelings of stress, muscle pains and tiredness. Long term use may lead to detrimental effects on your memory. Sinicuichi is a flowery plant originating in Mexico, Central America and Argentina. Sinicuichi belongs to the Lythraceae family. Its botanical name is Heimia Salicifolia, but the plant is more commonly known as ‘scrubby yellowcrest’, ‘sun opener’, or under the abbreviation ‘sini’. Traditionally, the plant was prepared by picking fresh leaves and leaving them to dry and wither. These dried leaves were then placed in a bowl of water and left to seep and brew in the sun for 24 hours. This preparation was supposed to imbue the brew with the ‘knowledge of the sun’. For this reason, Sinicuichi was also called ‘elixir of the sun’ and it was drunk for its soothsaying properties in divination.